A demi-glace is a rich, brown sauce based in French cuisine that is either used on its own or as a foundation for other sauces. There are quite a few steps involved with making demi-glace, and it's best if you emulate the classical French chefs and follow the traditional method in order to achieve its deep flavor and shiny finish. This means to plan on doing a lot of simmering, reducing, and straining, which may not difficult, but it is time-consuming. This is not to say that you need to do all of the steps at once, however. You can make the stock a few days or a week in advance if you like, or even longer if you freeze it. And preparing the Espagnole sauce, one of the French mother sauces, beforehand will also make this preparation seem less daunting. This recipe doesn't call for you to season the finished demi-glace in case you might be using it to make another sauce, which you would season during that cooking process. But if you're serving the demi-glace as a finished sauce, go ahead and season it to taste, with Kosher salt, at the very end. Wrap the thyme, parsley stems, and peppercorns in a piece of cheesecloth. Tie it with cooking twine to make a small bundle. Leave about 1-foot of twine so that you can tie the other end to one of your pot handles for easy retrieval later. Combine the brown sauce and the brown stock in a heavy-bottomed saucepan. Bring to a boil over medium-high heat, then lower heat to a simmer. Add the cheesecloth bundle, tying the string to the pot handle, and reduce the liquid for about 45 minutes, or until the total volume has reduced by half. Remove pan from heat and retrieve the sachet. Carefully pour the demi-glace through a wire mesh strainer lined with a piece of cheesecloth. You can make demi-glace with chicken stock instead of beef stock. As a matter of fact, the original demi-glace, which was called demi-Espagnole, was made using white stock (veal or chicken) in place of brown. 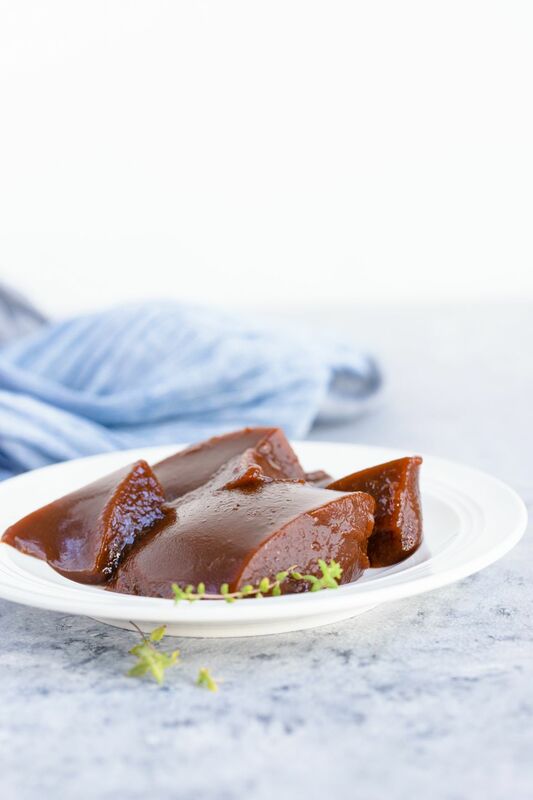 If you are pressed for time or don’t have the patience, you can save about 8 hours by following a shortcut recipe for demi-glace, with the chief difference being that it uses store-bought beef broth rather than homemade beef stock. However, be aware the demi-glace will lack body—a good stock should jell when you chill it, but the store-bought stuff won’t do that because it is lacking in gelatin (which is derived from the collagen in the bones). These days, with the popularity of the Instant Pot, you can make an extremely decent beef stock at home from just water and fresh beef bones from the Asian grocery store. Whether you make your own stock or use store-bought (or a combination), however, keep in mind that you’re going to need a lot to complete this recipe from start to finish. You need 3 cups to make the Espagnole sauce and another 2 cups to make the demi-glace.